MagnaClean is an innovative new product designed to safeguard your central heating system. Full central heating systems can cost a great deal of money to install and repair and therefore it is very important to keep them in optimum condition to avoid costly maintenance fees. Corrosion within radiators can cause Iron Oxide to build up inside the central heating system, forming a thick sludgy deposit. The smallest build up of iron oxide in gas or oil boilers can result in wastage of fuel, making the system inefficient and more expensive to run. 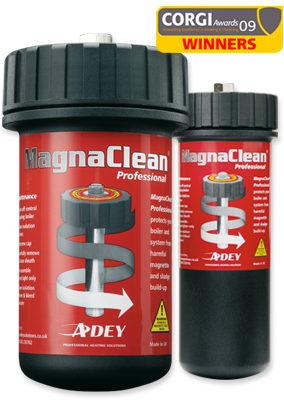 MagnaClean is a full-flow magnetic filter. It is specially designed to remove nearly 100% of the iron oxide from the system, and is suitable for all central heating systems, protecting and maintaining them for the future. In turn it also lowers the carbon emissions of your home which is very important in light of global warming. MagnaClean is simple to install and provides instant results, immediately benefitting your system as soon as it has been installed. There are no ongoing costs to run the Magnaclean, and servicing it is very fast and simple.